When it comes to female black belts, Jena Bishop, of Gracie Humaita San Diego, seems to be the talk of the town. She has won not just one, not just two, but three double golds this year- in Master Worlds, Pan Ams and Europeans. With these new feats on her resume, Bishop is no newbie to competition. 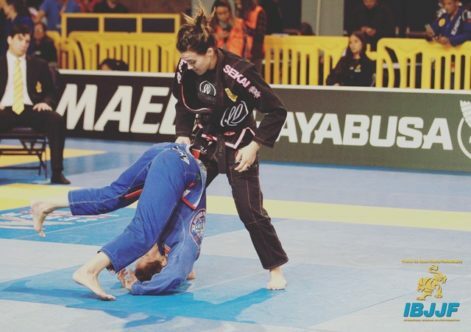 She began training jiu jitsu in 2007 and competed in her first tournament just four months in. “I haven’t stopped competing since,” she said. Born on Feb. 22, 1986, Bishop said she has always been a competitive person. Bishop trained from white to black belt with JW Wright at Gracie Humaita in St. Louis. 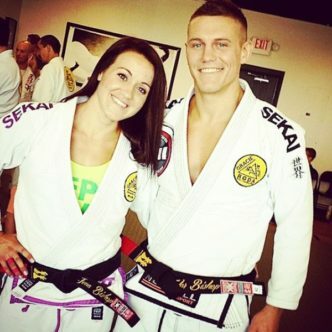 In 2016, she and her husband, Tyler, moved to San Diego, where they are jiu jitsu instructors at Gracie Humaita under Regis Lebre. Bishop teaches the kids, women and adult classes, where she trains 15-20 hours each week. A typical day for Bishop includes getting up and takes her fur babies, Niko and Toast, who are Shiba Inus, on a long walk. She used to be a personal trainer, but once she moved to San Diego, her main focus has been her jiu jitsu. However, she still follows a strength and conditioning routine two to three times a week, which is how she stays in shape, without weight cutting, for competition. While competing is always fun for Bishop, she said she still gets nervous before stepping on to the mat. Bishop competes not only in her weight class, but also in the open classes, where she has been winning matches against much larger women. Because she trains with men who are bigger and stronger than her every day, she said she thinks this helps her in strategizing against a larger opponent. And when competing in the adult versus master divisions, Bishop said the one huge difference is a 10 minute match versus a 6 minute match. While she has been competing a lot over the past year, she does not have a set plan for her next competition. “I need to take time to let my body rest and heal up a little bit, but you may see me at NOGI Worlds,” Bishop said. So, be stay on the lookout for Bishop; follow her blog at https://bishopbjj.com/, or watch some of her videos for inspiration. She believes the secret to her success is surrounding herself with the right people, seizing every opportunity and training smart.